For my entire photography career, I have been photographing the state of Kansas. I was born and raised here and outside of a five year stint in Texas as a child, I have lived here my entire life. I have traveled the backroads of the Flint Hills and Gypsum Hills. I have practiced my craft at the Keeper of the Plains in Wichita. And I have photographed more Kansas waterfalls than most people ever knew existed. I’ve watched a fireball streak across the sky as I photographed the Milky Way rising above Monument Rocks and I’ve even captured a few images of the Northern Lights at Quivira Wildlife Refuge while waiting on help to get my car unstuck from the mud. I’ve certainly traveled this state, and I want to showcase some of my favorite images from across the state and offer possibilities on how Kansas fine art prints might make wonderful additions to the decor of your home or office! By far, my best selling open edition prints come from Kansas. While I absolutely love to travel and shoot both new and familiar places around the world, I also love to take a Kansas road trip whenever possible! Whether it’s to photograph Teter Rock with Milky Way at night, catch a sunset at Monument Rocks or get a new shot of one of Kansas’ waterfalls after heavy rainfall, I love exploring and photographing my home state. 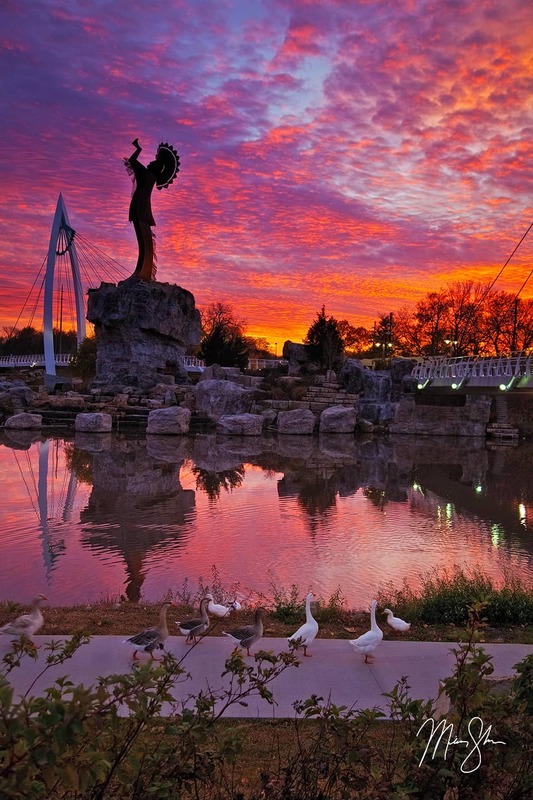 Like many states in the Great Plains, Kansas is under-appreciated for it’s beauty. Many love to remark that they want to just drive through to Colorado down I-70. And while I love Colorado, these people are missing some amazing points of interest! Little do they know that places such as Wilson Lake, Monument Rocks, Castle Rock, Cedar Bluff, Lake Scott and more are less than a half hour off of the highway! I take pride in my Kansas photography. I live in a unique place. Many of my photography friends live in places such as Washington or California. Those places are awesome. I love to travel and photograph there. But they’re full of thousands of photographers. Kansas and surrounding states just have a few of us showing off our state’s beauty and so I love to create fine art prints that only people from here in Kansas know about. When I’ve shown photographer friends from outside of Kansas a beautiful shot of Monument Rocks, many have said they would love to come shoot here. There are some hidden gems if you know where to look. And I’ve spend a decade looking! Like I said above, the vast majority of sales from my open edition print galleries come from Kansas photographs. Open editions are printed right here in Wichita, Kansas at a local print shop. My most popular method of open edition prints are plaque mounts. Plaque mounts, also known as wood mounts, offer a sleek and modern approach and provide a ready-to-hang image without the need of framing. I have also started selling more and more acrylic prints in recent years. Acrylic prints are also ready to hang without the need for framing. The prints are mounted onto clear acrylic, making it jump off the wall with vibrance and sharpness. I also offer standard prints that you can have matted and framed that are great quality as well. I have worked with all kinds of clients to make sure they were happy with their fine art. While many individuals love to purchase one of my images for their home, I have also been happy to supply a number of businesses with beautiful pieces of Kansas fine art to hang on their walls. From banks to dentist offices to financial advisors, I have images hanging at a wide variety of businesses across Kansas. I also offer image licensing of all open edition photographs for marketing purposes. If you run a business and you’re looking to give your walls an upgrade in decor, continue on to see the kind of work you could be displaying to your clients in your offices. In 2018, I launched my new luxury limited edition prints. While many of these prints are currently of my travel photography, I do have my first two limited edition Kansas fine art prints ready to. I also plan to add more Kansas limited edition photography throughout 2019 with a number of ideas already being planned for shoots throughout the year. You can view the first of many Kansas limited edition fine art pieces below. More limited edition images are available as fine art prints on the Limited Edition Fine Art Prints Gallery in beautiful print styles such as Lumachrome, Chromaluxe and premium wood mount. Two very different moments at the Keeper of the Plains: One a late autumn vivid sunset and the other a foggy spring morning. The Keeper of the Plains was where I cut my teeth on landscape photography. While I initially started out wanting to exclusively shoot travel and nature photography, I started trying my hand at shooting the Keeper of the Plains back in 2009. It was the Keeper that started my journey into shooting more of Kansas. For a number of years, whenever there was any chance at a nice sunset, I was racing out the door to the Keeper of the Plains. While I’ve branched out to many other places in Kansas, I will always have a special place in my heart for the Keeper and continue to visit from time to time to see what new pieces of fine art I might be able to produce. A few years ago, I felt like I was running out of composition ideas for the Keeper. Then I purchased a drone. My drone has opened up new possibilities and compositions that I’ve started to explore, like the photo below. 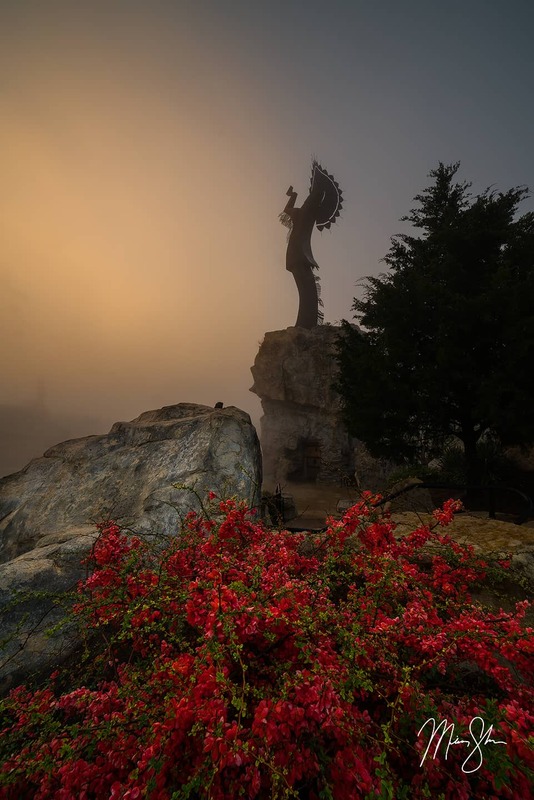 To view more Keeper of the Plains fine art prints for sale, visit the Keeper of the Plains Photography Gallery. Nothing says Kansas like tornados, wheat fields and sunflowers. While I don’t currently have any tornado photographs, I do have an abundance of sunflower and wheat field fine art prints! And when it comes to waterfalls, very few people even know Kansas has any waterfalls! I’ve found what is pushing 90 waterfalls in Kansas at this point, having photographed more than three-fourths of them. We have some beautiful waterfalls, such as Prather Creek Falls, Bourbon Falls and Geary Falls. 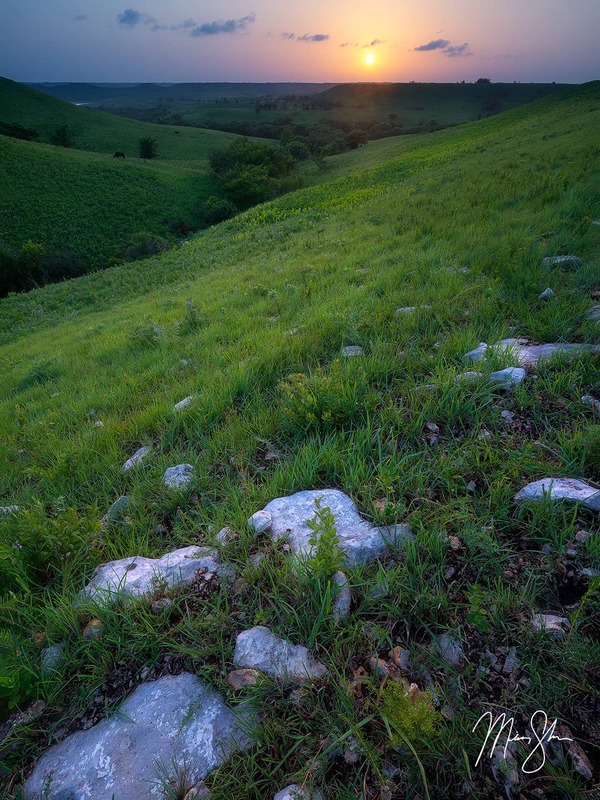 In addition to selling fine art prints of my Kansas photography, I have also developed a microsite called Kansas is Beautiful that helps people get out there and explore this beautiful state! All of my travels of finding waterfalls and other Kansas gems are laid out so you can visit them as well! I also plan to release a book titled “Kansas is Beautiful” sometime in the next year or two that details my decade long travels throughout the sunflower state! So keep an eye out for that! 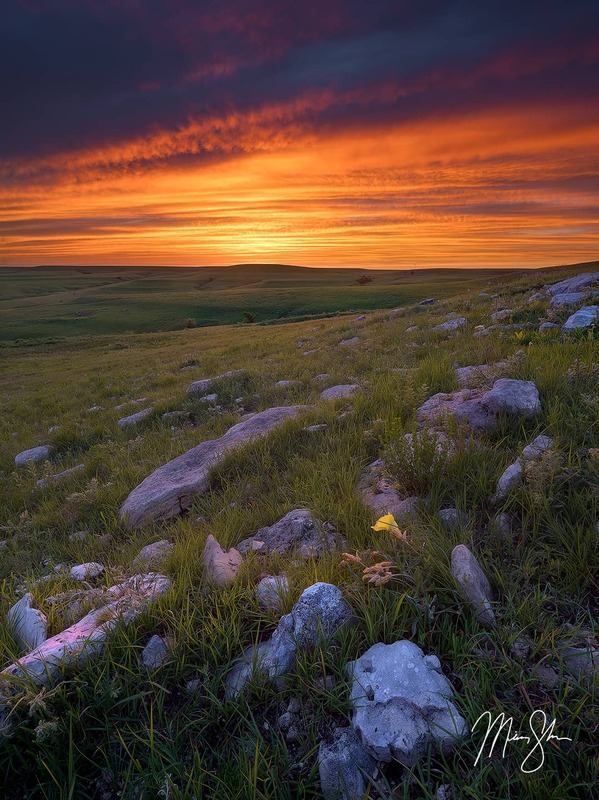 Thanks for reading and if you’re in the market for some Kansas fine art photographs to put on the walls of your home or office, feel free to browse the galleries above or reach out to me. I would love to discuss options with you!